Austin’s White Denim are one of few groups today that seem to exclusively draw influence from early musical realms, which is something that is less and less common among groups today. With the over-saturation of electronics in today’s music, their straight forward and rigid sound is an extremely fresh breath of air. Even with one of the biggest Canadian indie groups, Arcade Fire exhibiting an embrace of electronics with their new record, Reflektor. White Denim refuse to evolve their sound in this regard, and as a result their music is reminiscent of simpler musical times. 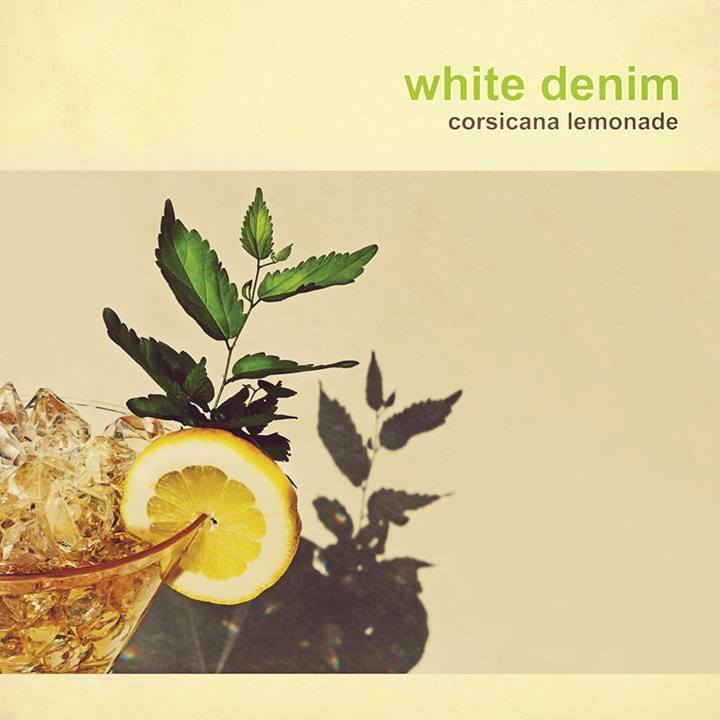 With 50’s/60’s era rock and roll sitting at the wheel, and genres like math-rock and folk taking passenger, White Denim’s newest effort Corsicana Lemonade stands tall among a sea of flat and uninspired rock music. With equal parts raucousness and serenity and a sea of influence that still appeals to the modern attention span, this album takes you on a trip that you won’t soon forget. One thing that White Denim has never lacked is musicianship; since the earliest releases from the group, their style has been tight-knit and well executed, with Corsicana Lemonade being no exception. James Petralli and Austin Jenkins guitar work is at their best, with minute long solo’s appearing in every crevasse of the record. Joshua Block’s drumming is as technical and creative as ever and Steven Terebecki’s bass playing is on point. How White Denim combine the elements of tracks like “Come Back” together can’t be easy, but they manage to mix genres seamlessly, making for a fun and catchy ride. “Pretty Green” is one of Corsicana Lemonade’s standout tracks, which starts as a foggy, tremolo soaked psych rock track before quickly jolting into a twangy, bluegrass-y tune. At times, these transitions sound like they’re the product of an ADD approach to writing music, but once the full picture develops White Denim prove that their creative process should not be questioned. The track was also produced by Wilco bandleader Jeff Tweedy, which likely explains the country and folk direction the track takes. Tweedy also found himself behind the mixing boards for Corsicana Lemonade as well. Like any group, White Denim have molded their sound over the years, and while Corsicana Lemonade may not sound exactly like 2009’s Fits, they aren’t vastly separated either. Though math-rock may not weigh as heavy on their musical scale it is still integral to their sound, and though folk is becoming a larger element of their music it is by no means the fundamental ingredient. Of course since the release of Fits, White Denim has seen the addition of a second guitarist to help boost their sound, which gave way to the psychedelic leanings of 2011’s effort D. White Denim’s dual guitar work is in full force on Corsicana Lemonade, with tracks like “Distant Relative Salute” and “Cheers Up/Blues Ending” riding groovy melodic guitar patterns. Effects are coated on most of the guitar work here like the tremolo washed grooves on “Limited by Stature”, but it isn’t enough to muddy the tracks at all. A new leaf appears on the ironically-titled tail end of the record “A Place to Start”, which is a shimmering track perfect for a long summer day by the pool complete with, that’s right, a lemonade in hand. While it constantly reminds me of Tommy James & The Shondells “Crystal Blue Persuasion” when it begins, it isn’t long before White Denim’s signature sound bleeds through and takes charge. Petralli’s heartfelt croons are clear signs of his complacency with the chorus driving the point “If I ever start to change for the worst, show me something real, I’ll try my best to turn it around”. “A Place to Start” is one of the only tracks to feature another instrument as well, with keys driving the smooth-rock meander of the track. Despite the many musical avenues traveled by White Denim on these tracks, they always seem to apply their unique boogie-rock tinge to make something memorable. Corsicana Lemonade’s tracks are complex but still singable, they are reminiscent while still relevant, and most importantly they are fun as all hell. According to James Petralli, “It’s taken five records to make one that sounds the way we do on stage”, and if that’s the case then I need to stop slacking and see these guys do their thing live. Housing a veritable smorgasbord of influence, Corsicana Lemonade may not be the most forward-thinking release from this Austin four-piece, but it does show how to properly have a good time playing music. Packed with driving guitars, catchy vocal melodies, and a great sense of some of past rock’s finest moments, this album in the very least makes me wish it were still summer.